Following the sounds of the eerie piper, I found myself under the unbreakable spell of Danny Weston. Wherever he leads, I follow. In the shadows of the ancient gravestones, I approached the lonesome figure. The following cheeky interview soon began . . . . .
Aside from the irksome duties of writing yet another book, I have been conducting some interesting experiments on literary critics. It’s interesting to note that no matter what age or size they are, they all take roughly the same time to drown. Quite by coincidence, all of them are people who have written bad reviews of The Piper. Strange that. I like to think that I have no peers, but of course dear long-lost Uncle Edgar was a great influence of my writing. His rib-tickling comedies The Premature Burial and The Fall of the House of Usher are still firm favourites at Weston Towers. We bring them out every Christmas and my goodness how we laugh! How much of The Piper is realistic? Well, the story deals with an ancient curse on a family home and a series of deaths that reoccur every sixty years… so I would say that it’s very realistic. I mean, there surely can’t be a house in the UK that hasn’t suffered similar problems at one time or another? I learned that if you wake up in the small hours of the morning to find little girls dancing to eerie music in your mist-wreathed garden, it’s probably not a good idea to go outside and join them. I also discovered that being an evacuee wasn’t a bed of roses. When did you get the idea for your debut book The Piper? Ah, now that was Uncle Victor’s fault. As I watched his figure hurtling over the cliff, two thoughts occurred to me. 1. What a good job he’d just changed his will in my favour and 2. There’s a book in this. As it transpires, I ended up cutting that scene but Victor, if you’re up there… ahem, I mean, if you’re down there watching this, thanks for the inspiration! As he departed into the mist, his final words were: "Did I really make it into Mr Ripley's Top Ten Favourite Reads 2014?" "Well the supernatural gods must have been shining down on me on that day," he whispered. Without any further hesitation he vanished, apart from his cheeky chuckle which could still be heard trailing behind him. 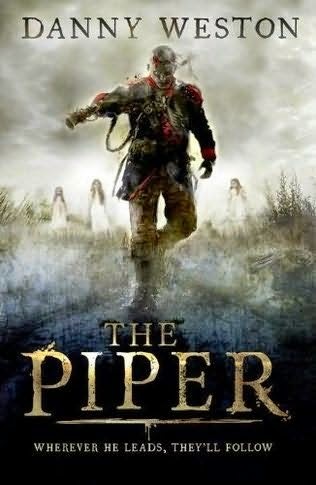 Out now in all good bookshops, but beware of the haunting sounds of the piper!